There is no limit to the uses for this set of four coasters. 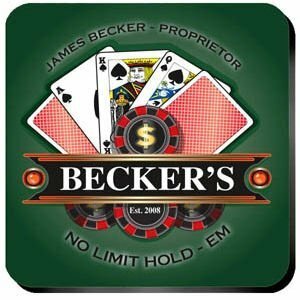 Protect your felt-topped poker table and furniture from drink rings with these fun and festive poker themed coasters. Cards and poker chips are prominently displayed in the full color design. Specify the lucky poker player's first and last name for the personalization. You can bet the coaster set with mahogany caddy will be appreciated.